Two (2) Years of reading Sagada related features, forums, replying to tourist’s e-mails text messages, YM chats and as a Tourist Guide. Here is what I came up with!! Possible Questions that you guys would be asking. Before taking that pen and copying my email (crazyhim16@yahoo.com) ” friendster too” (hehehe) or cellphone number (+639295569553) and decide to ask me something. Read First…. How do I get to SAGADA? Which route will I take driving my own vehicle to Sagada? Is there a direct trip to Sagada from Manila? Where’s the Best Place to Visit? Are there Sample Itineraries I could follow? How’s the Weather in Sagada NOW? Is it SAFE for a Lone Female traveler to visit SAGADA? Is there Someone I could Contact from Sagada? How’s the Road Condition going to SAGADA? Can my Vehicle reach Sagada? Are there Travel Agencies that offer scheduled Tours in Sagada? thanks a lot... me too, im looking forward to be back this sembreak.. i really missed that place..
hi gareth, thank you for the information about Sagada... It wsa very helpful.. tama ka, one needs to bring alaxan.. hehe! nagtanong ako dun, taga dun ka pala.. and sa inyo pala yung store lapit sa sumaguing cave.. I love Sagada and definitely, I will be back! hey guys may I suggest for you to write your true identification?who knows visitors might want to hire you because you are their relative or they know your family etc etc.You don't have to remain incognito!Nothing to hide isn't it? ay sik a sa Malecdan? You look different from that pic a Pinmulaw ka bassit he he he he .nagapo ka od is city of man anya. your postings are great.Way to go young man.. follow your dreams..ngemgawis gedan nan mang lepas is college tay sha sa nan tawid ay maid maka akew.This is your anti talking!How are you? bakit puro lalaki ang guides? wala bang babae? 1. we'll be 10 in all, family rather than barkada... so budget is a consideration. 2. travelling with 2 senior citizens and 1 two year old. btw we plan to leave for baguio on dec 23 and proceed to sagada on the 25th or 26th..do we need to book prior to coming to sagada this time of year or can we just drop in and shop for hotels there? i love this site except i'm going blind trying to read thru the font color used. I could barely see any words on the screen. pics are great but please, can u not used a more user-friendly color? 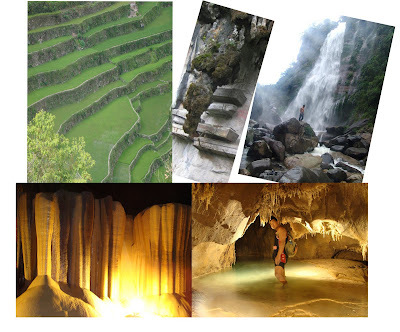 HI..WE ARE PLANING TO GO TO SAGADA CAN YOU BE OUR TOUR GUIDE? PLS EMAIL ME aaronmodels@yahoo.com also how much is the fee? hi po ulit. isang bagay lang po ang di nadiscuss sa FAQ's nyo, it is about bringing kids, is it advisable to bring kids to Sagada? can they handle the long walks? My daughter is almost 9 and i have two nephews about 6 and 11. Please advise me ASAP 09209084096 if we can bring them. Thanks! kuya erwin and the rest of the guides - thanks for the experience.sagada is worth the body ache.a very unforgettable adventure. Minette Bassig - Travel Factor Participant April 1-4, 2010.
shanghai house food is over rated..
We are planning of visiting sagada on Holy Week. We have kids 5,7 and 8 yo. Are there activities that they can join there?